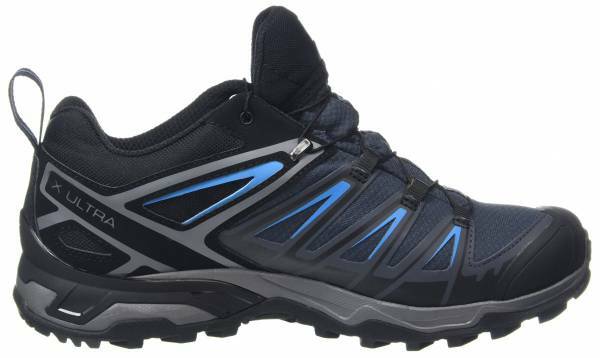 The Salomon X Ultra 3 GTX low is outstandingly comfortable, according to a considerable number of users. A couple of them attributed it to the shoe’s Ortholite footbed. Many owners, including a critic, lauded this shoe for its praiseworthy waterproofing. A large number of wearers were quick to commend the X Ultra 3 GTX’s Contagrip outsole. They said its traction held up well even over slippery surfaces. A couple of footwear reviewers and dozens of Salomon patrons were wowed by the supreme lightness of this hiker. This hiking shoe impressed a handful of users with its quick lacing system. The amount of arch and heel support the Salomon X Ultra 3 GTX provides is simply off the charts, based on a few positive reviews. This shoe garnered praises from a couple of hikers for its minimal break-in period. A female gear blogger became instantly fond of the overall look of the Salomon X Ultra 3 GTX women’s after donning it for the first time. Many wearers couldn’t help but berate the X Ultra 3 GTX for running small. This Salomon hiking gear was found deplorable by several individuals because of its restrictively narrow build. A very small percentage of owners questioned the overall durability of the shoe. A professional reviewer among them saw his pair start to crease around the forefoot flex area after only a month of use. The quest for finding the shoe that provides genuine hiking comfort seems to be fulfilled with the Salomon X Ultra 3 GTX. This lightweight hiking shoe provides excellent grip (especially on wet terrain) and offers first-rate water protection. Some people, however, were critical about its inconsistent sizing, detesting both its narrow width and fit that runs small. Overall, this below-the-ankle hiker does not disappoint on almost all fronts but may require buyers to order a half or whole size larger to get a consistent fit. If you are willing to pay a little extra for top performance, the X Ultra 3 GTX will not let you down. They provided above average support and stability, and offered a unique, quick closing, tie-less lacing system. All told, the X Ultra delivers what I want for day hiking and lightweight backpacking: the feeling of a trail runner but with the added comfort and protection that you get from a hiking-specific model. Overall the X Ultra 3 hiking shoes are a triumph of design and development, with some minor but worthy improvements over the previous models. The Salomon X Ultra 3 GTX has received a handful of upgrades over its predecessor (the X Ultra 2 GTX). While the shoe’s upper is virtually unchanged with its synthetic primary coverage and Gore-Tex waterproof lining, it has a sleeker overall profile and slimmer overlay design compared to the previous model. Several changes have been made to the X Ultra 3 GTX’s lacing system as well. More synthetic lace loops are used in this version. Salomon engineers also gave the shoe an extra pair of classic eyelets placed at the collar line, increasing the number of eyelets from 8 to 10. Arguably, the most notable update to this hiker is found in its Contagrip outsole. It inherits the multi-directional lugs of the previous version, but with an extra feature at the heel called Descent Control. This technology does exactly what its name implies. It gives users more control and stopping power when descending slopes and inclines. Salomon’s X Ultra 3 GTX is a low-top, fairly true-to-size day hiking shoe for both men and women. The men’s version comes in widths D – Standard and 2E – Wide and may be owned in sizes 7 through 14, with half sizes until 11.5. The women’s variant, on the other hand, is offered in B – Standard width and comes in sizes 5 through 12, with half sizes until 10.5. The shoe’s updated quick lacing system gives wearers a solid lockdown in a matter of seconds. Giving wearers a precise fit is the Salomon Sensifit technology. Technically an overlay, this technology provides fit precision depending on the amount of lace pressure applied by the user. On the traction front, the X Ultra 3 GTX features a High Traction Contagrip outsole which aims to grant wearers optimal ground grip with its aggressive, 5 mm multi-angular lugs. This Salomon-owned sole technology is divided into two major densities: low and high. Low-density portions manage grip while high-density sections promote sole durability and aids in edging maneuvers. The heel zone of the Contagrip outsole is engineered with ridges positioned at opposing angles. This region, officially called Descent Control, further improves the shoe’s capability to provide traction, specifically during steep downhill slopes. Extending ever so slightly towards the upper and encroaching the rubber toe bumper, the outsole gives the X Ultra 3 GTX a rubberized tip. This extension, bearing the S (for Salomon) logo, further strengthens the front end of the shoe, adding an extra layer of toe protection. For underfoot cushioning, stability, and shock absorption, the designers crafted the shoe with an ethylene-vinyl acetate or EVA midsole. This cushy foam of a platform is characterized by toughness and stress resistance. It also rivals rubber when it comes to elasticity. Its thick-to-narrow construction starting from the heel gives the shoe an overall sleek look. Salomon’s Advanced Chassis has also found its way into the X Ultra 3 GTX. This frame-like component elevates the wearer’s hiking performance by providing extra stability and rebound. It also grants motion control and additional flexibility. The removable insole that comes default with the Salomon X Ultra 3 GTX low is primarily made of an Ortholite foam. This proprietary footbed cushions the foot while maintaining a cool and comfortable environment within the shoe’s interior. Its cupped rear end, which is made of EVA, yields ample heel support. The Salomon X Ultra 3 GTX is evidently lightweight thanks to its layered upper which is a fusion of textile fabrics and synthetic materials. The stitched-on overlay gives not only a precise fit but also abrasion protection. When it comes to water intrusion prevention, the brand’s engineers infused the shoe’s upper with the Gore-Tex Performance Comfort laminate. This is a moderately insulated lining which also promotes ventilation inside to maintain a cozy, in-shoe feel. This footgear comes with a gusseted tongue. This protective design prevents unwanted entry of dirt, water, and pebbles while on the trail. It attaches the tongue to both sides of the boot (behind the lace eyelets). Additionally, at the back of the contoured ankle collar is a pull tab for swift on and off. Located at the front end of the forefoot zone is a hardy toe cap. This rubberized coverage, together with the outsole’s rubber tip, promises toe protection by minimizing impact shock when the forefoot collides with hazards, such as rocks, boulders, and bulging roots. This hiker’s closure system employs the brand’s Quicklace system. It has a sturdy cord in place of classic laces. This cord passes through a series of lace loops made of synthetic material and makes its way through a pair of standard eyelets at the ankle cuff line. It is secured with an adjustable locking clip. The remainder of the cord may be tucked inside the sleeve that is attached to the upper portion of the tongue. The brand recommends the following care instructions to help extend the life of the Salomon X Ultra 3 GTX low. After each use, remove accumulated dirt using a soft, damp brush. Rinse it under clean water. Never machine wash the shoe. Dry it at room temperature without using any external heat source. The lining should be periodically cleaned to prevent the build-up of odor and preserve its integrity. Wearing socks when using the shoe is also recommended. Sockliners can be machine washed using warm water. Clean and replace as necessary.